Within a mother's embrace, her children and loved ones experience a love beyond compare. Now that eternal bond of love is realized in the Mother's Embrace Personalized Birthstone Ring, a fine jewelry exclusive from The Bradford Exchange. Provide the names of up to 5 children or loved ones, along with their sparkling crystal birthstones, to create a personalized jewelry treasure as unique as the family it celebrates.This solid sterling silver ring features a stylish contemporary design that you customize. 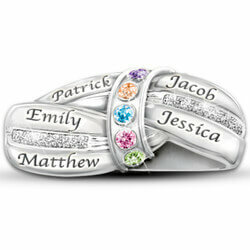 Each child's name is elegantly engraved on the entwined bands, accented with 2 rows of pave set crystals. Embracing the center of the ring is a circle of sparkling crystal birthstones, one for each loved one. Strong demand is expected for this unique jewelry design, destined to become a family keepsake. Order now!